Haematrol K from Equine Products UK is an iron enriched formula which helps to maintain a healthy circulatory system in horses. It contains vitamins C & K which are provided to formulate prothrombin, for blood clotting, and as an antioxidant which mops up free radicals in the lung capillaries. The recommended feeding amount is 25g per day and on racing day. 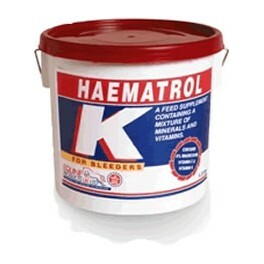 There are currently no questions for Equine Products UK Haematrol K for Horses - be the first to ask one!